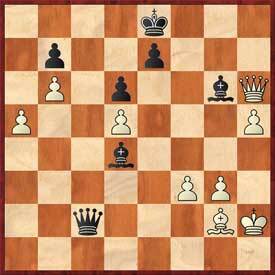 The New England Nor'easters were the big winners of Week 7 of the US Chess League , as they were able to clinch a playoff berth after a 3-1 win over the Philadelphia Inventors, thanks to nice wins by IM Jan van de Mortel and NM Alex Cherniack. You can read IM Jan van de Mortel's recap of the match here. The Boston Blitz and New York Knights remain in 2nd and 3rd place, as they drew with the New Jersey Knockouts and the Carolina Cobras, respectively. 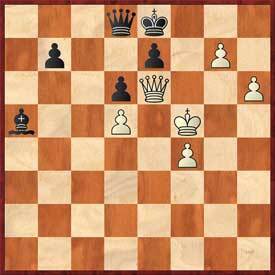 Carolina was able to draw the heavily favored Knights thanks to IM Jonathan Schroer, who won a very nice game against GM Giorgi Kacheishvili, earning him the Endgame Clothing Upset Prize. The Baltimore Kingfishers remain in 4th place despite losing to the Manhattan Applesauce, who are now only a half-point out of the last playoff spot. New Jersey, Philadelphia, and Carolina will now need a small miracle to make the playoffs. The big showdown of the Western Division was between the San Francisco Mechanics and Arizona Scorpions, who have been among the leaders of the division all season. Arizona won this crucial match thanks to nice wins by IM Daniel Rensch and IM-elect Robby Adamson. Arizona moves up to 1st place, jumping over the Chicago Blaze, who lost a very tough match to the now 4th place Saint Louis Archbishops. San Francisco is in 3rd while Seattle, Miami, and Los Angeles are only a half-point behind Saint Louis. Although Dallas is currently in last place, they are still only a point away and have decent chances to make the post-season. Visit uschessleague.com for more recaps, news, and lineups for next week! Ok, let's give out some awards! Again, White was victorious in all four games (don't worry, I'll get some draws in this category soon), and while the first three wins were sharp and clean, the outcome of the fourth board was never clear until the very end. More analysis on this awesome match to follow. Nd7. 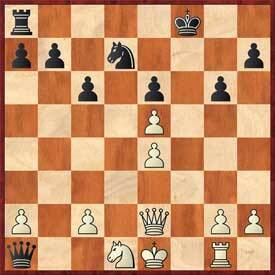 15...Nh6 loses incredibly to 16.hxg4 Nxg4 17.Rxh5! 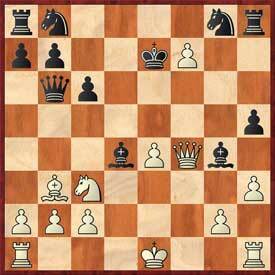 Bxc3+ 18.bxc3 Qg1+ 19.Kd2 Rd8+ 20.Rd5! And the game was drawn about 30 moves later. 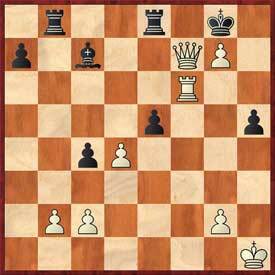 Black was a little bit better in the following endgame that arose after 25 moves. 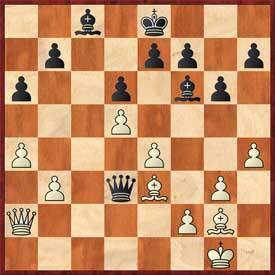 Although a queen and 2 bishops endgame is rare, it seems as though a queen trade will happen soon (because neither side should want to give up control of the c-file) and the ensuing bishop endgame will be relatively dry and probably result in a draw. 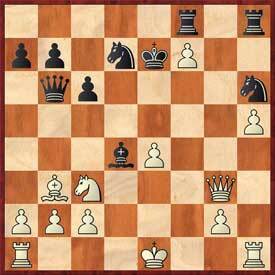 It is what happens in the next 47 moves in this game that earns it the title of Most Intriguing Endgame. 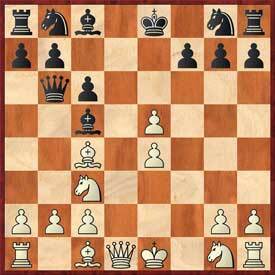 26.Qa3 Qd1+ 27.Kh2 Bc3 28.b4!? 31.e5?! Bxe5 32.f3 Bf5 33.Bxa5? 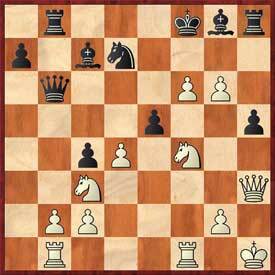 34.Qb4 Qf2 35.Qe1 Bc2 36.Qc1 Kf8 37.Bd2 Bf5 38.Bh6+ Kg8 39.Bg5 f6 40.Bf4 h5 41.a5 g5 42.Bxg5! 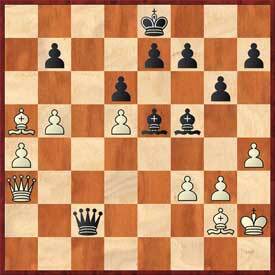 43.Qxc2 I'm not sure why this wasn't played, after 43...Bxc2 44.Bd2 Bd3 45.b6 It seems like White should be able to play this on and eventually convert his extra-pawn advantage. 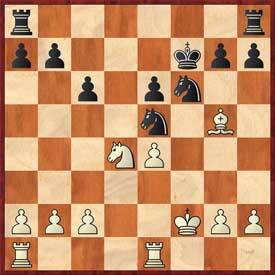 52...Bh7 should win easily, but perhaps Black missed that the f-pawn was pinned? 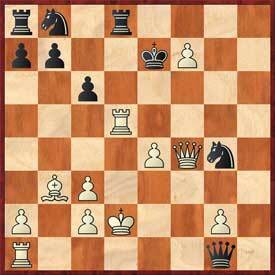 55.Kh3 Qf2 56.Qxf5 Qxf3+ 57.Kh4 Bf6+ 58.g5 Qh1+ 59.Qh3 Qe1+? I thought this game should get some notice because it had a very aesthetically pleasing pawn storm to decide the battle. 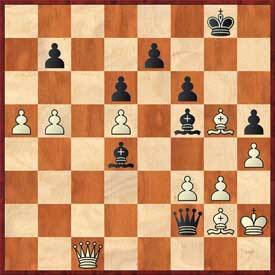 After 16 moves, the players reached the following position which was fairly unbalanced, but let's see how the young GM used his pawns to attack the weakened position around Black's king. 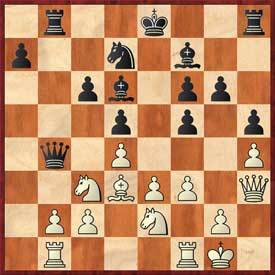 Black tries a pawn thrust of his own, but his position is very difficult to defend. 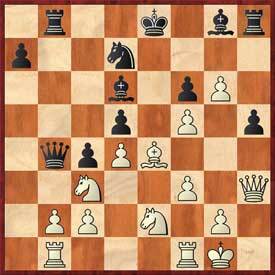 19...fxg5 looks relatively better but White has a very strong attack after 20.Rbe1. 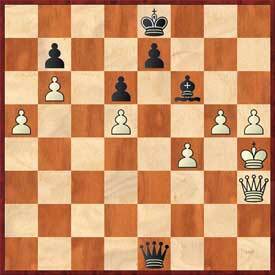 White sacrifices a piece but gets four very strong pawns ready to attack the opposing king. 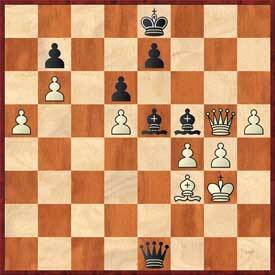 The pawns are too strong and the Rf1 now wins the game for White. The g-pawn will queen with checkmate, a just finish for pawn enthusiasts. That's all for this week! Check back here every week for USCL highlights. Follow all Week Eight action live on the Internet Chess Club, and find pgn downloads, line-ups, blogs and Game of the Week details on uschessleague.com.